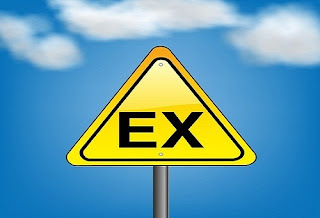 The best friend's ex "rule"
In his latest blog post titled '2015: closing cycles,' Coelho wrote "Things pass, and the best we can do is to let them really go away." It is 2016 today so I guess everything in 2015 should be in the past at this point, but something has come back to haunt me. One of my closest friends, a girl I have been friends with since my teenage years, dropped a bomb on me. She said I had to choose between our friendship and my friendship with her ex-boyfriend. If you are a guy, you are probably rolling your eyes right now 'cause you don't even understand how this could be an issue. But if you are a girl, you might be thinking "OMG, of course you can't." But this is not high school anymore and life is not black or white. There is a lot of gray. And I believe this is one of those situations. Let me explain. Best friend and X dated for almost 5 years. There were a lot of up and downs, and a million breakups happened before the final breakup two years ago. And of course throughout all the breaking up and making up, guess who was there? Me, among many other friends, trying to patch things up. Of course, there were also good times during those 5 years, like our trip to China: walking the Great Wall together, being kidnapped by a taxi driver in Beijing, and almost missing our train to Shanghai. All those are memories I will cherish forever and have created a special bond between X and I: it is called friendship. But apparently now that she decided to part ways with him and move on, I am expected to do the same and my friendship with him has to vanish, as if it had never happened. I get that it is not an ideal situation. But telling me that my friendship with him hinders her ability to move on seems a bit extreme, especially since she she has not been single for a minute since breaking up with him and the break up was almost two years ago. But even if she were single, how is it fair to me to have to lose my friendship with him because she decided he didn't fit into her life anymore? Another argument she used was that if she hadn't dated him, I wouldn't have met him. I get that, but why is that a reason to stop talking to him? Does it mean that anytime a friend introduces you to another friend, he or she will always belong to that first friend? 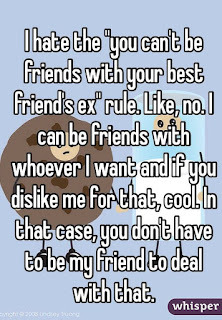 That you are just the "secondary" friendship, not a standalone friendship. Does it mean that friend number 1 will always have a say in your new friendship with friend number 2? Of course, friendships differ in intensity, but comparing them doesn't make any sense. Some friends you talk to once a day, some once a year, some friends you have know for half your life, some for half a minute, but it doesn't necessarily mean that one friendship is more important than another or that one friendship beats another out if there were to be a friendship battle. Would you want to have to choose between your best friend from college and your best friend from work? I don't think so. 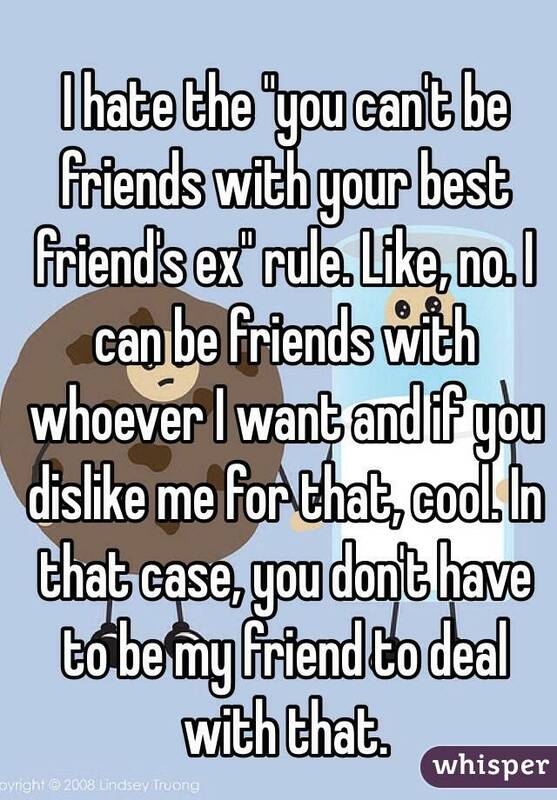 In my opinion, every friendship is a special bond whether old or new, and as much as I don't want to break my bond with her, I don't want to break my bond with him either. It would be giving up my integrity and my values and I am not willing to do that. It doesn't mean I pick him. It doesn't t mean I enjoy seeing how hurt she is by this situation and that I am not willing to make some efforts to minimize the pain she is feeling, but I will not turn my back on him because she is not capable of letting him go. As mentionned above, "Things pass, and the best we can do is to let them really go away." So hopefully she will be able to let him really go away in the near future and I will be able to let go of all the jibes she has been throwing my way in the last few days. And then, maybe our friendship will survive. It might not. Only time will tell. And maybe you disagree with me and think I am being mean and disloyal to her, but the fact is being loyal is what has gotten me into this mess. I have always been loyal to her and there when she needed me. But I refuse to be disloyal to him when he hasn't deserved it so she can feel better about herself. It is not fair.